The 2015 NBA Playoffs started early this morning way up north, with Paul Pierce once again wearing the black hat and tormenting the Toronto Raptors. Pierce was effective in Game 1, scoring 20 points total and spearheading Washington’s offensive in the overtime as the Wiz snatched the series’s initiative from the Raps. Steph Curry, as expected, did well, too, scoring 34 points as the Dubs survived a late charge by the Pelicans to grab a 1-0 series lead. 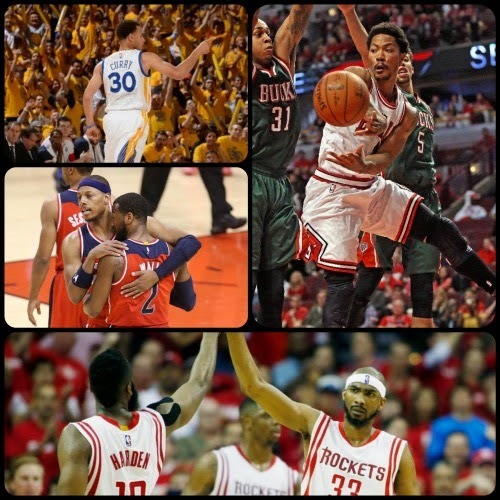 Derrick Rose also impressed in his first postseason game since 2012, dropping 23 markers as the Chicago Bulls drubbed the Milwaukee Bucks, while James Harden had a lot of help from Jason Terry, Trevor Ariza, and Terrence Jones to get a 1-0 advantage in the Houston Rockets’ own series against cross-state rivals Dallas. 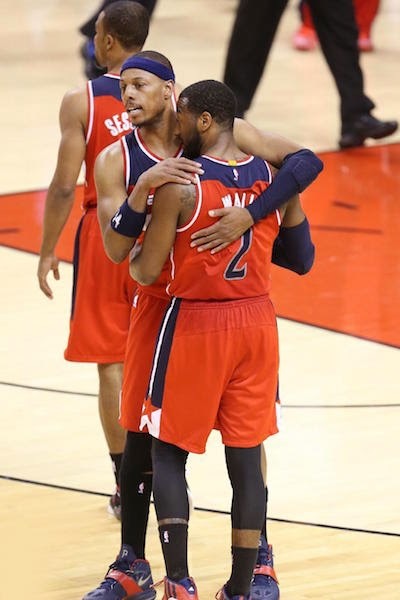 - After blowing a fourth-quarter lead, the Washington Wizards only allowed four points in overtime in their 93-86 win over the Toronto Raptors in Game 1 of this Eastern Conference quarterfinal series. The fifth-seeded Wizards led by as many as 15 in the fourth quarter but could not hang on. But in overtime, they limited Toronto to 2- of-9 shooting and 0-of-4 from 3-point range. Paul Pierce scored five of his 20 points in overtime to pace Washington. Bradley Beal added 16 points and Nene scored 12 with a game-high 13 rebounds. Toronto has reached the postseason seven times in franchise history, and it lost its opening game for the seventh time. Amir Johnson led the fourth-seeded Raptors with 18 points off the bench and was a part of a second unit that outscored Toronto's starters by a 48-38 margin. DeMar DeRozan scored 15 points and added 11 boards and six assists. Toronto will host Game 2 of the series on Tuesday. Paul Pierce and John Wall stole homecourt after winning Game 1 in Canada. - Every time New Orleans dented Golden State's lead, the Warriors responded. Until the Pelicans ran out of time. Stephen Curry netted 19 of his 34 points in the first half and Golden State held off New Orleans 106-99 in Game 1 of this Western Conference quarterfinal. A 14-0 Pelicans run that bled into the early stages of the fourth quarter trimmed a 25-point deficit to 11. Curry and Klay Thompson, however, hit consecutive 3-pointers to begin a 7-0 swing and temporarily put the game out of reach again. A 7-0 New Orleans spurt later in the frame cut the gap to 93-83 with under four minutes left, but the Warriors kept the Pelicans at bay down the stretch. New Orleans was within four in the final minute but never got over the hump. Game 2 is Monday night in Oakland. Draymond Green posted 15 points, 12 rebounds and seven assists, Andrew Bogut tallied 12 points, 14 boards and five assists and Thompson scored 21 for Golden State, which won an NBA-best 67 games and went 39-2 at home during the regular season. Anthony Davis had a fantastic playoff debut, pouring in 20 of his 35 points in the fourth for the Pelicans, who played in their first postseason game since 2011. They beat out the Oklahoma City Thunder for the final playoff spot after beating the defending-champion San Antonio Spurs on the NBA's last day of the regular season Wednesday. 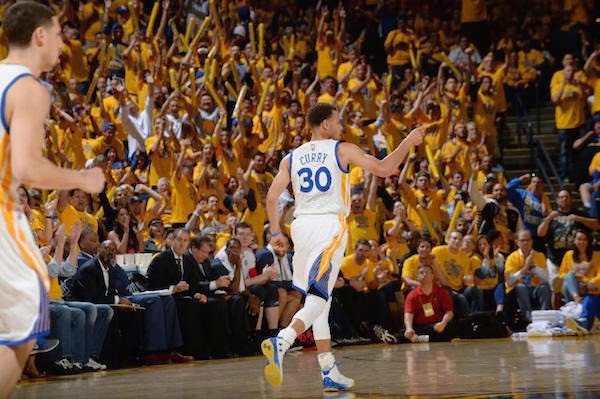 Unsurprisingly, Steph Curry proved to be the big difference-maker for GSW in Game 1. 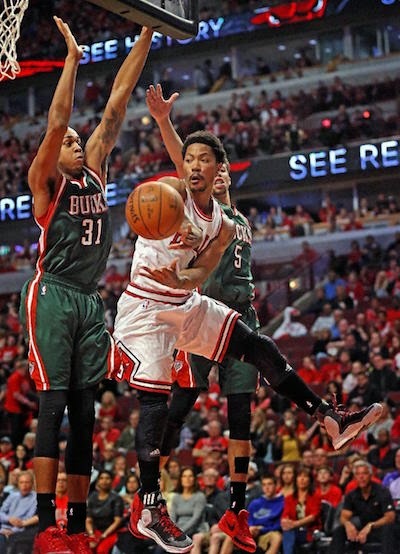 - The Bulls will be a tough out if Derrick Rose plays like he did on Saturday. Rose looked as healthy as he has all season and netted 23 points to lead third-seeded Chicago to a 103-91 win over the visiting Milwaukee Bucks in Game 1 of the Eastern Conference quarterfinals. Rose's career has been filled with injuries and lost seasons since his MVP campaign in 2010-11. He's missed nearly 50 games per season over his last three, including 31 this season, and hadn't appeared in a postseason game since tearing his ACL in 2012 against Philadelphia. But the explosiveness and creativity that made Rose one of the league's best talents four years ago made a timely cameo, helping him finish 9-for-16 from the floor with seven assists. Jimmy Butler scored a game-high 25 points and Pau Gasol posted 10 points and 13 rebounds for the Bulls, who will host Milwaukee in Game 2 on Monday. Khris Middleton scored 18 points to lead five Bucks in double figures. Derrick Rose's return to the postseason was nothing short of triumphant. - James Harden had 24 points and 11 assists, Terrence Jones and Trevor Ariza did a little bit of everything and the Houston Rockets beat the Dallas Mavericks 118-108 on Saturday in Game 1 of their first-round playoff series. Harden, who became the first Rockets player to record at least 20 points and 10 assists in a playoff game since Tracy McGrady in 2007, carried Houston for long stretches this season, but it was a balanced effort on Saturday. Jones finished with 19 points, nine rebounds and six assists while Ariza totaled 12, 11 and six. Dwight Howard added 11 points and five blocks while battling foul trouble, and Jason Terry made four 3-pointers en route to 16 points for the second-seeded Rockets. Mavericks star Dirk Nowitzki scored 24 points on an efficient 10-for-14 shooting and Tyson Chandler had 11 points and 18 rebounds in the loss. Game 2 is set for Tuesday. 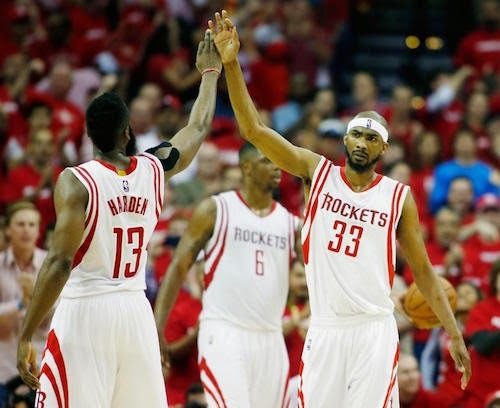 James Harden and Corey Brewer conspired to help Houston beat Dallas in Game 1.